‘Pradhan Mantri Krishi Sinchai Yojana’ to be implemented in mission mode. 28.5 lakh hectares will be brought under irrigation. A dedicated Long Term Irrigation Fund will be created in NABARD with an initial corpus of about Rs. 20,000 crore. 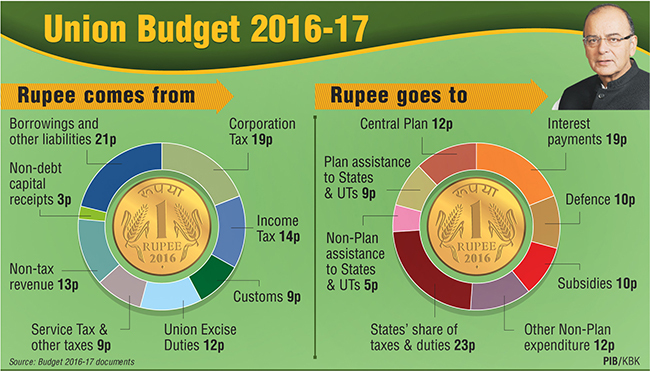 'Transform India' to have a significant impact on economy and lives of people. 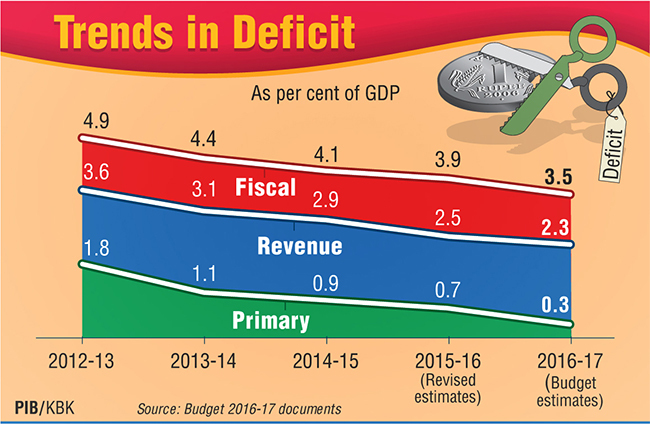 ensuring macro-economic stability and prudent fiscal management. Focus on enhancing expenditure in priority areas of - farm and rural sector, social sector, infrastructure sector employment generation and recapitalisation of the banks. Allocation under Prime Minister Fasal Bima Yojana Rs. 5,500 crore. 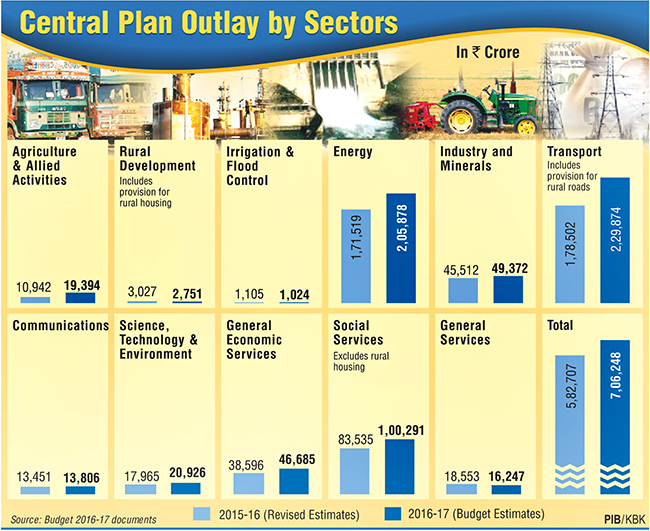 Allocation for rural sector - Rs. 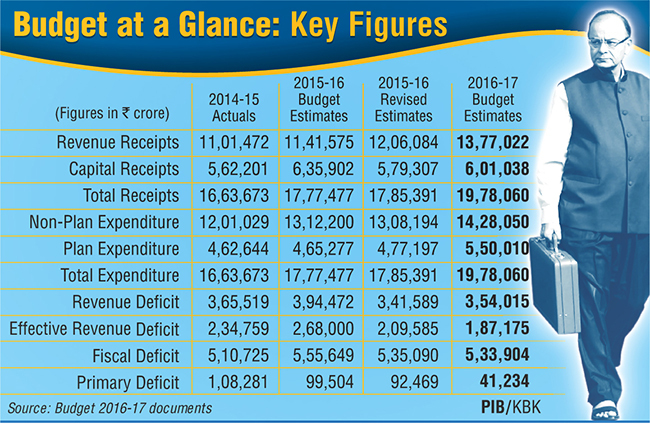 87,765 crore. New scheme Rashtriya Gram Swaraj Abhiyan proposed with allocation of Rs. 655 crore. 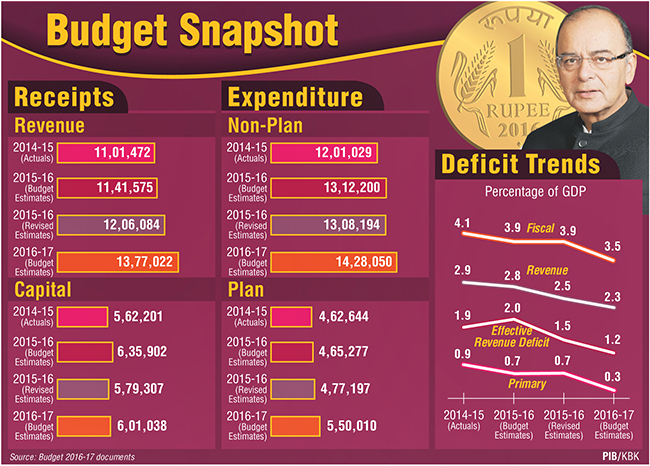 Allocation for social sector including education and health care –Rs. 1,51,581 crore. New health protection scheme will provide health cover up to Rs. One lakh per family. For senior citizens an additional top-up package up to Rs. 30,000 will be provided. 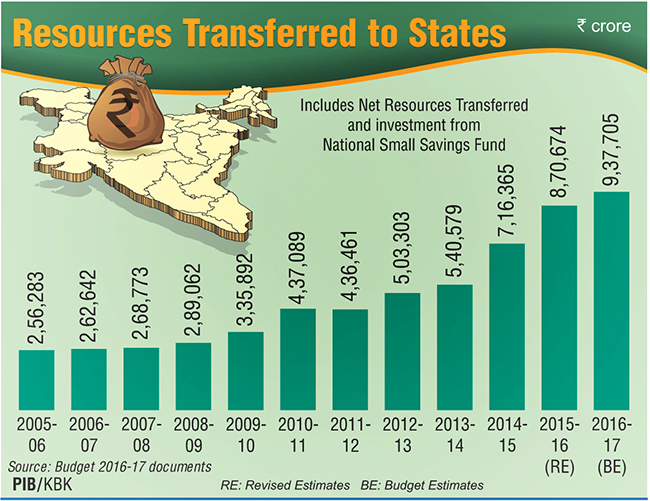 Allocation of Rs. 100 crore each for celebrating the Birth Centenary of Pandit Deen Dayal Upadhyay and the 350th Birth Anniversary of Guru Gobind Singh. Allocation of Rs. 55,000 crore in the Budget for Roads. Additional Rs. 15,000 crore to be raised by NHAI through bonds. A new policy for management of Government investment in Public Sector Enterprises, including disinvestment and strategic sale, approved. increased to Rs. 1,80,000 crore. Raise the ceiling of tax rebate under section 87A from Rs. 2000 to Rs. 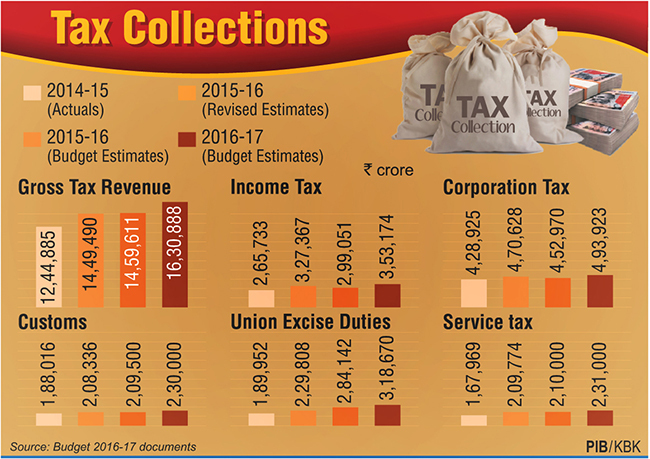 5000 to lessen tax burden on individuals with income upto Rs. 5 laks. Rs. 24000 per annum to Rs. 60000, to provide relief to those who live in rented houses. Limit for contribution of employer in recognized Provident and Superannuation Fund of Rs. 1.5 lakh per annum for taking tax benefit. Exemption from service tax for Annuity services provided by NPS and Services provided by EPFO to employees. Rs. 35 lakh sanctioned in 2016-17 for first time home buyers, where house cost does not exceed Rs. 50 lakh. 60 square metres under any scheme of the Central or State Government including PPP Schemes. Additional tax at the rate of 10% of gross amount of dividend will be payable by the recipients receiving dividend in excess of Rs. 10 lakh per annum. Tax to be deducted at source at the rate of 1 % on purchase of luxury cars exceeding value of Rs. ten lakh and purchase of goods and services in cash exceeding Rs. two lakh. Equalization levy of 6% of gross amount for payment made to non- residents exceeding Rs. 1 lakh a year in case of B2B transactions. Excise duty of ‘1% without input tax credit or 12.5% with input tax credit’ on articles of jewellery [excluding silver jewellery, other than studded with diamonds and some other precious stones], with a higher exemption and eligibility limits of Rs. 6 crores and Rs. 12 crores respectively. Excise on readymade garments with retail price of Rs. 1000 or more raised to 2% without input tax credit or 12.5% with input tax credit. ‘Clean Energy Cess’ levied on coal, lignite and peat renamed to ‘Clean Environment Cess’ and rate increased from Rs. 200 per tonne to Rs. 400 per tonne. New Dispute Resolution Scheme to be introduced. No penalty in respect of cases with disputed tax up to Rs. 10 lakh. Cases with disputed tax exceeding Rs. 10 lakh to be subjected to 25% of the minimum of the imposable penalty. Any pending appeal against a penalty order can also be settled by paying 25% of the minimum of the imposable penalty and tax interest on quantum addition. Monetary limit for deciding an appeal by a single member Bench of ITAT enhanced from Rs. 15 lakhs to Rs. 50 lakhs.